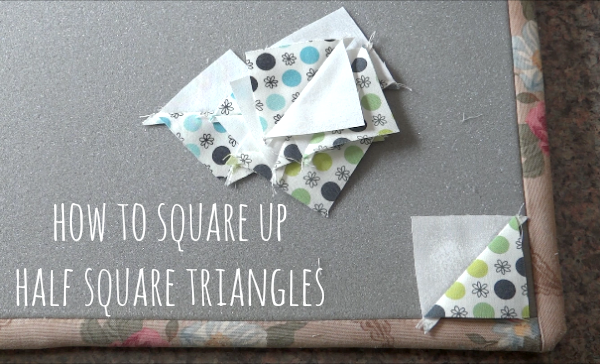 Today we will go over how to square up half square triangles. This is not my favorite task to do for quilting. Squaring up half square triangles. blah. Really that’s how I feel. For many years and many projects I ignored this step of squaring up. I thought it didn’t matter and wouldn’t be a big deal to skip it. After being told by many including my mother…. I have changed my ways and have found that squaring up your half square triangles is pretty important. 1- lay your half square triangles on your cutting mat- you will be using the lines on your ruler, not your mat! 2- using the lines on the ruler, line up one end of the ruler near the edge or the block. You can use the 45′ angle on the ruler to help line up with the half square triangle as well. *if you are using bloc loc- have that groove in the ruler lock into the diagonal seam. love this ruler! *trimming those tiny points off helps with reducing the bulk when you are sewing these together. Less in the corner seam the better! Have any tips to share about squaring up?